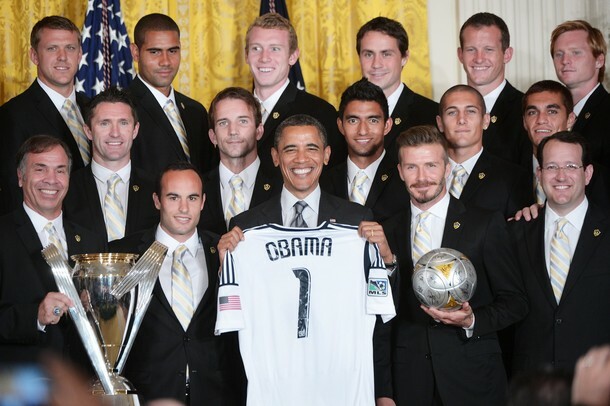 president obama received his official galaxy shirt from landon donovan and a spanish conquistador david beckham. Now that league champions have been crowned, and European places are (almost) finalized, everyone’s attention has briefly transitioned from on-field matters to off. Transfer speculation is in full swing, managers have been hired and fired, and agents are busy trying to count their chickens before they’ve hatched, Even the American President has gotten in on the action. And like every other seasons’ end, I’m struggling to finalize post drafts that I’ve been working on for weeks/months. Some will be trashed, while others might yet see the light of day. So as I busy myself with making such important decisions, here are ten of my favorite links from the last week to satisfy your quench for footie-related goodness. Spurs’ new Under Armour kits are… surprisingly acceptable. How the players reacted when Hodgson was named England manager.